Tulips is an original crochet pattern by June Gilbank. A beautiful realistic tulip flower with a clever one-piece construction – you'll love how it comes together! Add some colour to your life with a bouquet of everlasting tulips. Option: This pattern will work with any size yarn, provided you choose a suitable hook size for your yarn. 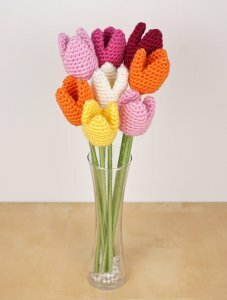 For a lifesize tulip, I recommend worsted weight yarn.